For the love of everything under the sun. A heart and “Chase the Sun” Billabong graphic is printed onto the chest of a throwback raglan sleeve t-shirt. The 3/4 sleeve tee features a contrast neck and sleeve and rounded hem. Girls graphic raglan sleeve t-shirt. Contrast 3/4 length sleeve and crew neck. 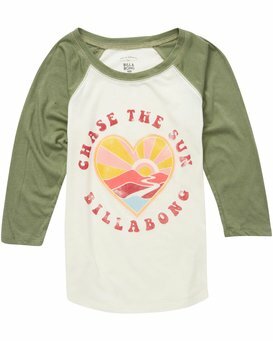 ”Chase the Sun” artwork printed at the chest. Material: cotton modal blend jersey.